The Vancouver Canucks announced the end of a 474-game sellout streak last Friday via an email to season ticket members. The streak lasted 11 seasons and was the longest active streak in the NHL. As the Canucks adjust to new personnel on and off the ice, fans in this market are still not sure what to make of the team. Ultimately, the fans will speak with their wallets and it will be very interesting to see what the crowds at Rogers Arena are going to be like for the next few weeks. With your help, I’ve compiled the Top 10 Ways the Vancouver Canucks Can Start a New Sellout Streak. I like the positive vibe from Cathy but it seems easier said than done. 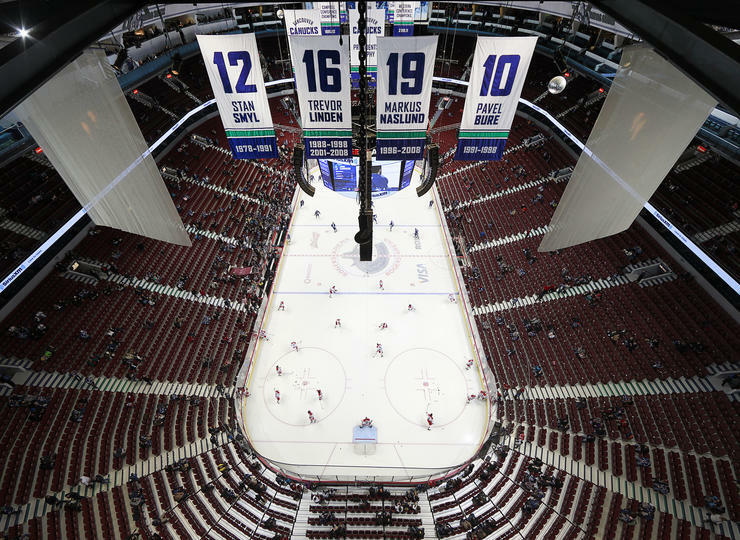 The Canucks tried a new initiative at the start of the 2008-2009 season: they wanted to honour its fans as the “7th Canuck” before every home game. Not sure how long it lasted, but you can see the launch here. HM: Make every home game a “Jersey Off Our Back” night. This is one of the Canucks’ most popular promotions. But is there really a market for 41 Shawn Matthias jerseys? More positive vibes from Betty here and she touches on something I’ve been preaching for the past couple of weeks: people can be so darn negative! Chris touches on an atmosphere that many people have been complaining about for years. Whether it’s the product on the ice, the game day presentation, or the number of fans occupied on their cell phones, the atmosphere has certainly been lacking…especially last season. Ryan calls it as many people saw it: that the club was either counting comps or buying up unsold seats to keep the streak going. Seems like someone isn’t sold on the new regime. 6: Make every home game a “Guaranteed Win” night (tickets to an upcoming home game if the Canucks lose). This didn’t work so well for the BC Lions earlier this year. But it would create a buzz win or lose. According to Wikipedia, the 51 year-old Agrodome has a capacity of 3,300 people for hockey. Sounds doable. I had no clue what a “roomie hot dog” was so I wrote back for a quick explanation. Methinks Quinn was hungry when tweeting me his suggestions. 3: Have Mark Donnelly always perform the anthems while on ice skates. We’ve all seen the video. Now it’s time to see it live. Some real talk from the number one Canucks fan in Edmonton. This one makes sense to me: winning is the tonic for everything. It worked for Dallas last night, didn’t it?